Both dogs and cats can shed a large amount of hair. It depends on the breed, but almost all dogs and cats shed to some degree. If you have pets, you know how the hair can get everywhere and become almost impossible to clean up. If pet hair seems to be taking over your house, there are some tips and products you can use to reduce shedding significantly. Regular Brushing - Brush your pet every other day, or even daily if they have heavy and thick coats. 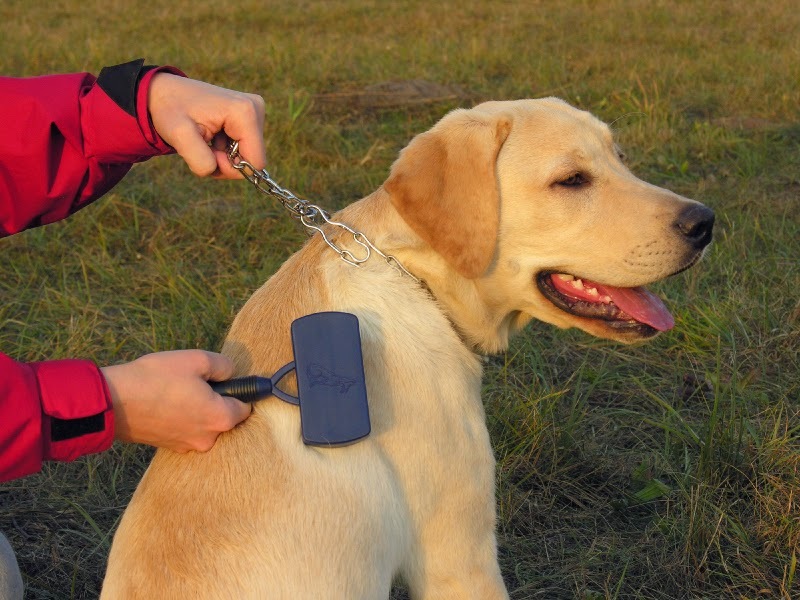 Dogs with two coats, an undercoat and a top coat, tend to need the most brushing. This is the best thing you can do to minimize shedding because brushing removes loose hair before it can fall on your floor. It also distributes oil from the skin over the hair, leaving it suppler and less likely to shed. Give Your Pet Fatty Acid Supplements - The Optima 365 for dogs or cats is a fatty acid supplement that also contains vitamins and minerals. Fatty acids improve the pet's skin and coat, effectively reducing shedding. Optima 365 contains antioxidants and 33 percent fewer calories than other brands, which is why it is preferred among pet owners. Feed High Quality Food - Your pet's hair is a direct reflection of the quality of their diet. Feed your dog or cat a diet that contains high amounts of digestible protein. Not enough protein or nutrients cause your pet's hair to be brittle and weak, which leads to more shedding. You can also give moist, healthy foods as treats, such as melons, peas and carrots. Brush with a Shedding Tool - Shedding tools such as the FURminator deshedding tool target the animal's undercoat, which is the source of shedding issues. The undercoat contains loose and dead hair that is difficult to remove with regular brushing or baths. The FURminator removes these hairs easily without tugging or damaging the topcoat. Bathe Your Pet Regularly with Anti-Shedding Shampoo - Regular baths keep your pet's skin and hair healthy, which prevents hair from falling out. Bathing regularly also removes loose hair before it has a chance to fall on your carpet. To further reduce shedding, you can use a pet shampoo specifically engineered to combat shedding. In addition to their shedding tool, FURminator makes such a shampoo that contains fatty acids, proteins and minerals to help reduce shedding. Use a Topical Skin Care Formula - A new way to deliver needed nutrients, topical skin care applications provide hydration, protein and essential oils directly to your pet's skin. Products like Dermoscent Essential 6 Spot-On Skin Care are easy to apply while promoting healthy skin, reducing dandruff and deodorizing. Take Your Pet for Regular Vet Checkups - Some dogs or cats have allergies that can often manifest as skin conditions. Visit the vet regularly to check for these and other skin issues. Unhealthy or dry skin results in more shedding. Your vet might offer prescription medication to help with the skin conditions. Some amount of shedding is inevitable for any type of dog or cat with hair. Indoor pets tend to shed year-round, as opposed to strictly seasonal. Cleaning hair that is shed daily prevents buildup. It is much easier to clean small amounts regularly than waiting a month or more before removing hair. Use a lint roller or a simple wet paper towel to remove pet hair from carpets and furniture. Keep up on your vacuuming to prevent pet hair from working down into carpets and becoming difficult to remove. With these preventative tips, you can control the amount of shedding and prevent the tedious cleanup. Combine several of them and the pet hair in your home will be noticeably more manageable. When it comes to the health of your pet, you are likely to think about pest, disease, and worm prevention first. But the easiest thing to overlook is simple maintenance. Haircuts, nail trims, baths, and ear cleaning all contribute to your pet’s health. It may come as a surprise, but dogs and cats’ ears are extremely sensitive due to the moist environment inside their ears. While some cats may be able to groom themselves, others may be prone to ear mites and all dogs will need routine ear cleaning to fend away ear infections and possible deafness. Virbac’s Epi-Otic Ear Cleansers are perfect for the job, and most veterinarians will not hesitate to recommend them. The care of your cat’s or dog’s ears is extremely important; and with proper care, your pet will never have any trouble responding to your voice. Epi-Otic Ear Cleanser is a non-irritant solution that will clear any excess grime and wax build-up from your dog or cat’s ears. Due to its gentle nature, Epi-Otic is also safe to administer to puppies and kittens as well. Apply the cleanser daily, weekly, or during your pet’s bath for convenience, and experience a healthier and happier friend instantly. The main difference between the Epi-Otic Ear Cleanser and Epi-Otic Advanced Ear Cleanser is that the latter is targeted towards pets with a severe case of Otitis Externa, which is a case of inflammation in the ear or ear canal. The two lines of cleansers essentially do the same thing; the Advanced is simply more powerful with added anti-odor properties. Both are specially formulated with anti-adhesive properties and drying agents to prevent bacteria and yeast from sticking to and populating in the ear. Spherulites: an encapsulation system that allows the ingredients in the cleansers to release slowly and steadily for a long lasting effect. This system is exclusively made and patented by Virbac. Chitosanide: an ingredient that forms a layer of film over the skin and hair to protect your animal’s skim from harmful effects of the environment. Salicylic Acid: an anti-septic agent that encourages dead skin cells to shed (in Epi-Otic Advanced only). Shake the formula, and twist the nozzle to open. Place a few drops into your pet’s ear. Close or fold the ear flap and gently massage the base of the ear for about 30 seconds. Allow your pet to shake out the excess liquid out, then carefully blot the ear with a cotton ball to wipe away any leftover wax or buildup. Note: Do not place anything inside the ear canal as that may pierce or harm the eardrum. Your pets provide you with so much love and happiness, so make sure you provide the same by keeping them clean and healthy for maximum fulfillment. Epi-Otic Ear Cleansers contribute greatly to this, and this brand name cleansing line can be purchased at www.medi-vet.com in the lowest prices. While upper respiratory infections occur commonly in adult cats as well, kittens suffer from the most severe symptoms. These symptoms include lack of appetite, runny eyes, lethargy, coughing, runny nose and sneezing. Feline upper respiratory infections are highly contagious among cats of all ages. The two most common culprits for this illness are the feline rhinotracheitis virus (also known as herpesvirus) and the feline calicivirus. You can vaccinate your kitten or cat against both of these. While vaccination does not completely prevent upper respiratory infections, inoculated cats and kittens experience less severe cases. There are a multitude of reasons why your kitten may be experiencing diarrhea; the reason could be as simple as switching up its food or from stress - especially when first separated from their families. However, it can also signal the presence of intestinal parasites like worms and one-celled parasites. A lot of kittens contract hookworms or roundworms, because they ingest them when feeding on their mother's milk. Tapeworms and fleas go hand-in-hand because fleas serve as intermediate hosts for this type of worm; cats can also catch tapeworms from small prey. Taking proper flea prevention measures and limiting access to wild animals will likely diminish your kitten’s possibilities of getting tapeworms. Last resort, you can also effectively de-worm kittens with medications. While cats can get ear mites, here and there, at any age, kittens can suffer from them frequently. Look for a discharge in the ear that looks like black/brown coffee grounds. Since kittens will often scratch their ears when they have ear mites, sores and redness around the ears is a common indication as well. Ringworm is not really a worm, but an infectious, itchy skin fungus that causes hair loss. Symptoms include skin lesions and bald patches on the ears, head or forelimbs. However, you can expect to see hair loss throughout the entire body in severe cases. Kittens with milder cases of ringworm might simply show symptoms of dandruff. Ringworms are highly contagious, and humans can catch it from kittens as well - even if the cat shows no signs of having the infection. Feline distemper, also known as panleukopenia, is a highly contagious infection that can lead to death. Symptoms include fever, vomiting, lack of appetite and diarrhea. Luckily, you can protect your kitten with a feline distemper vaccine. 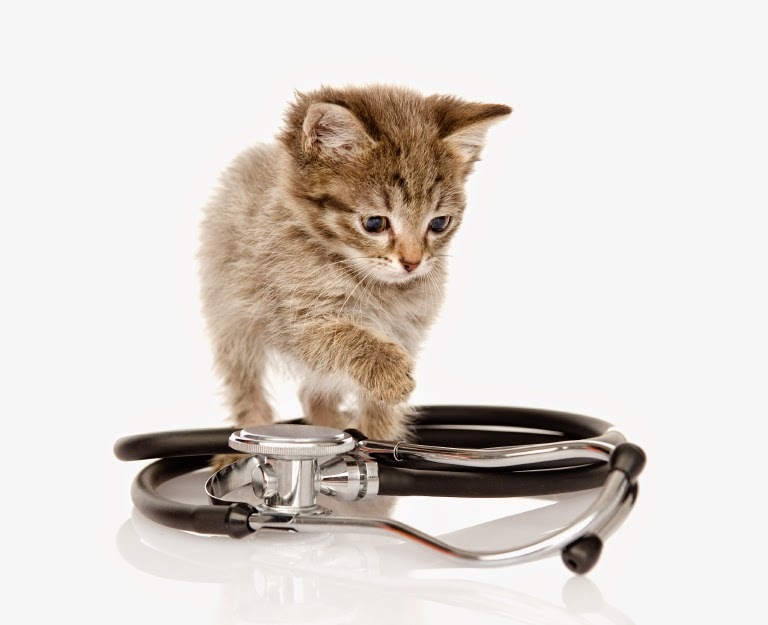 Watch for signs of these common illnesses when you are adopting and raising a kitten. However, rely on a good veterinarian for a concrete diagnosis.